An enabling piece of web-based technology for many of NorthEast Monitoring’s products. LX Remote moves data between a remote site and a central analysis site. For example, consider a cardiology practice with multiple offices for patients to visit but a centralized analysis facility, or a scanning service with client doctors’ offices all over the world. Designed to provide HIPAA-compliant, secure, digital methods to move ECG data from the remote location to the analysis location and then return the pdf report files back to the remote location. Developed to make management and deployment as easy as possible. No need to load software applications or plug in hardware (USB) keys at remote sites. A cost saving for scanning services and other multi-location service providers. 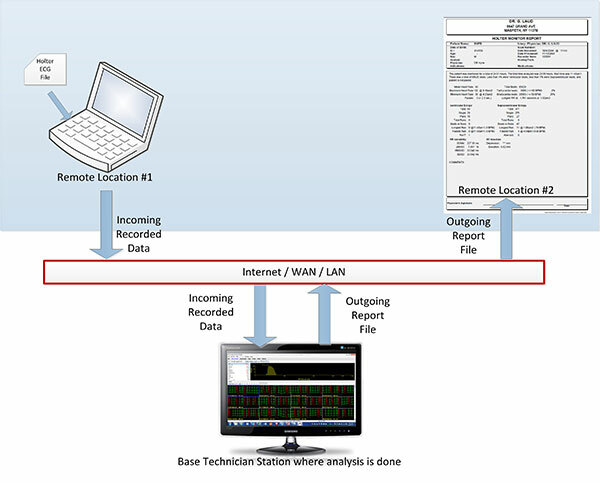 LX® Remote is a web-based application used to transfer ambulatory cardiac data from a remote location (often a remote clinic or doctor’s office) to a centralized analysis / service location (often a Scanning Service or doctor’s office with analysis capability). Each Remote User has a dedicated log-in and is associated with an analysis / service location. Data is encrypted on the Remote User’s computer and is decrypted on the analysis / service computer. The web application used to transfer the data between the computers has no ability to decrypt the data. In the case where LX Remote is used by a large cardiology practice, the Remote Users are often the satellite offices where the recorders are deployed to patients. In the case where LX Remote is used by a Scanning Service provider, the Remote Users are the cardiologist / physician customers of that Scanning Service.The key users are the Administrator, Technician(s) and Remote User(s). This innovative approach uses a Java-based applet that is deployed to both the Administrator and Remote location via an internet connection. Since no specific application software installation is required, it is quick and easy to add new satellite offices / customers and more fully utilize the analysis software at the central site. Once an LX Remote Administrator account is established, Remote Users are assigned usernames / passwords and are managed entirely by the Administrator.